Summer is upon us, which is also know as the season where I gush about stone fruit. Peaches are a clear favorite in my book, and I use them in everything, from savory to sweet. 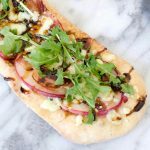 This recipe has a lot to gush about – bacon (yum), gorgonzola cheese (yum) and it’s a great single serving size recipe. I scaled this as a recipe for two, but I’m confident that you can do the simple math to scale the recipe in half. Plus you get to eat half of a peach as a snack that way. You’re welcome. You should also go ahead and make yourself some peach buttermilk ice cream for dessert. In other news the fog is here in San Francisco. We’re lucky to live in a sunny neighborhood, but we can still see the thick blankets of fog that roll in over the city and make it fairly chilly all summer long! It’s one of those things that people love to hate about San Francisco summers. Compared to the rain and snow of Wisconsin though, I welcome the fog with open arms. 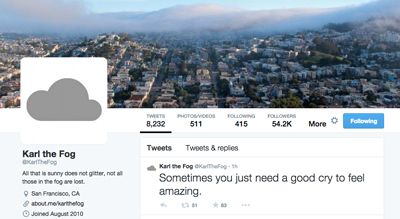 If you’re looking for a laugh, check out the Twitter or Instagram accounts of San Francisco’s famous Karl the Fog. What’s your favorite stone fruit? Are you a die-hard peach lover like myself or a nectarines more your thing? In a small saucepan on medium heat, reduce the balsamic vinegar by half. Watch carefully as it can easily burn. 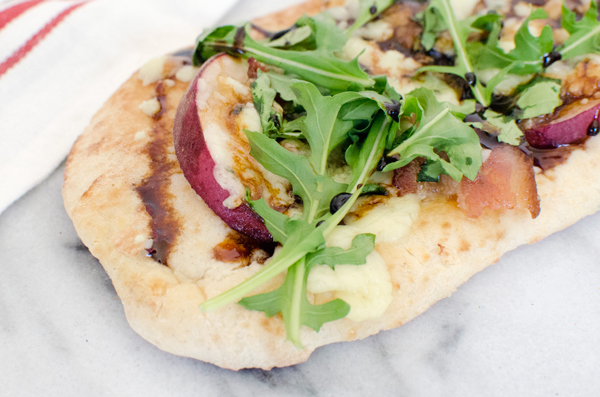 Layer the sliced peaches and bacon on the naan flatbread. 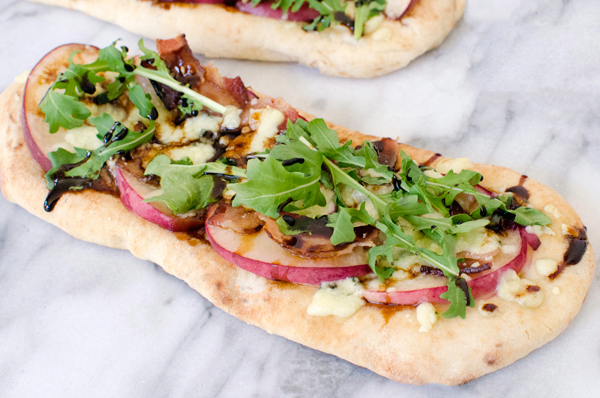 Top with crumbled Gorgonzola cheese. 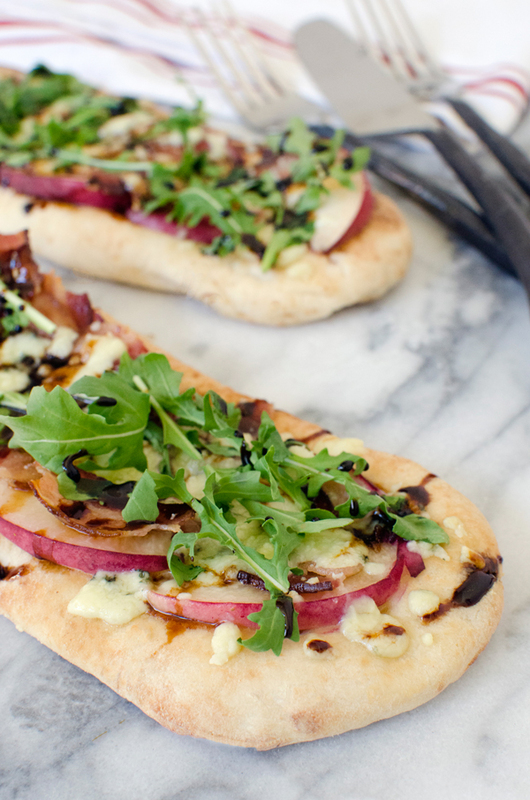 Top with arugula and drizzle with reduced balsamic vinegar. 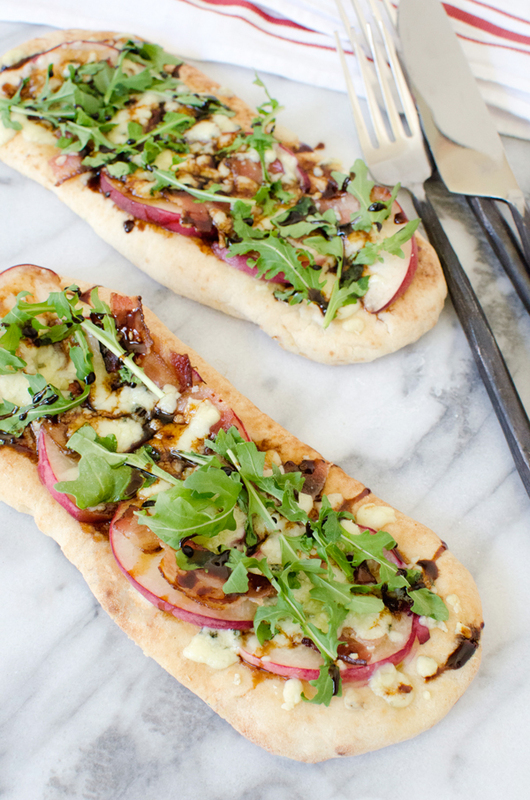 Tip: I love bacon, but if you’re trying to make this recipe a bit healthier, you can leave it out. These look amazing! I made a similar pizza last Sunday! 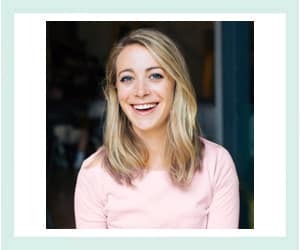 Can’t wait to try this version!